A giant car bow creates a holiday atmosphere on your auto sales lot and in your showroom. Car bows lift the spirit of everyone in your dealership, customers and employees alike. Giant car bows make people feel special, provoke cheerful conversation and in a tasteful memorable way present each vehicle as a gift suggestion. Many automotive dealerships provide additional customer service by giving a car bow away with each purchase. This high quality 30" Shiny Vinyl Car Showroom Bow comes with a magnet to help secure to vehicle and the bow is designed to be used either indoors or outdoors. Car bows are used by dealerships in their showrooms to express the holiday spirit. Many auto dealers also receive requests for car bows from their customers, who purchased the vehicle as a "gift-car" and then want to "gift-wrap" it. The 14" Red Metallic Pull Bow is the perfect touch for your oversized present. These bows come in easy to ship flat package. Upon opening, simply pull the strings to create the bow. 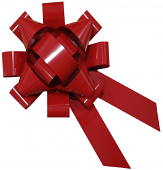 The 43" Red Velvet Car Bow is perfect for that special gift or to use in any showroom. This bow is the nicest bow on the market and comes with padded magnet to help secure to vehicle. It will not scratch vehicles.